Britain's most iconic presenter and naturalist Sir David Attenborough has pointed out a key limiting factor in 3D nature documentaries, explaining that it is currently impossible to get a good 3D image of anything that isn't right in front of the camera. Speaking at the premiere of the beautifully shot Bachelor King 3D film from Atlantic Productions and Sky, Attenborough explained that the penguins that star in the film were the perfect candidates, because you can get the bulky 3D rigs close into the birds without disturbing them unduly. However, don't expect stunning 3D footage of particularly nervous animals any time soon – because the way in which the 3D cameras work makes telephoto lenses almost impossible to use. 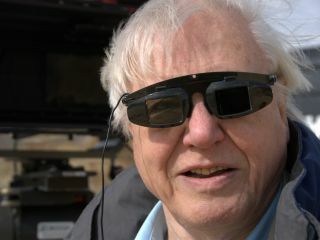 "There is a further tech problem about filming in 3D which isn't just the fault of the camera," Attenborough told a Q&A session attended by TechRadar. "At the moment technically it is impossible to use a long telephoto lens; the reason being that 3D camera mimics the human eye and has two cameras close together with the same kind of separation as our own. "If you shut one eye when looking at something that's close to you, you get one view, shut the other you get another view, and the brain puts those two together. "If you're looking at something on the other side of this theatre, you would see no difference. The way that you would get a stereo image is to separate the two components further. "But when you do that…they have different backgrounds so it won't go together. So with the state-of-the-art at the moment it's not possible to use long lenses. "And that is a very considerable problem when it comes to natural history programming."